Tickets are available through the Eventbrite Link for the 5th Annual Luncheon Honoring Maryland’s First Lady Yumi Hogan. 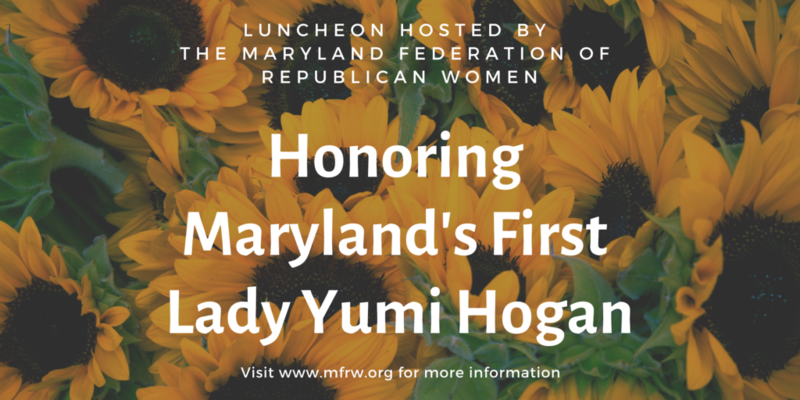 The Maryland Federation of Republican Women (MFRW) will honor Maryland’s First Lady, Yumi Hogan at its 5th Annual Luncheon at Live! Casino & Hotel in Maryland. New this year a VIP Reception will begin at 11:00 a.m. and be followed by the Luncheon beginning at 12:00 p.m including remarks by the First Lady. Raffle baskets and a silent auction will be featured at the Luncheon. This year’s theme is Inspiring Hearts Grow Community. Twenty-five percent of the net proceeds will benefit Mrs. Hogan’s Charity, Yumi C.A.R.E.S, whose mission is Children’s Art for Recovery, Empowerment, and Strength.